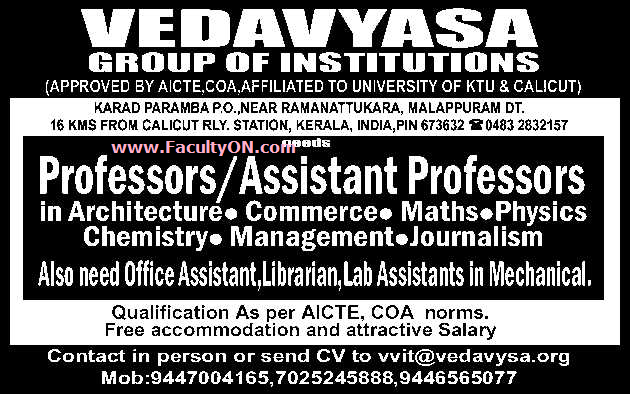 Vedavyasa Group of Institutions, Malappuram has advertised in THE HINDU newspaper for recruitment of Professor / Assistant Professor Non-Faculty jobs vacancies. Interested and eligible job aspirants are requested to apply immediately from 27th June 2018. Check out further more details below. About College: The college has carved a niche for itself in education world, eloquently demonstrated by the flying colors attained by its students in academics, placements as well as extra curricular and co curricular activities. VVIT is affiliated to University of Calicut/Kerala Technological University, approved by Government of Kerala and All India Council for Technical Education (AICTE), New Delhi. Attractive Salary will be offered. How to Apply: Interested and eligible candidates are requested to send CV along with copies of certificates and recent PP size photo to the email address given below or contact in person.